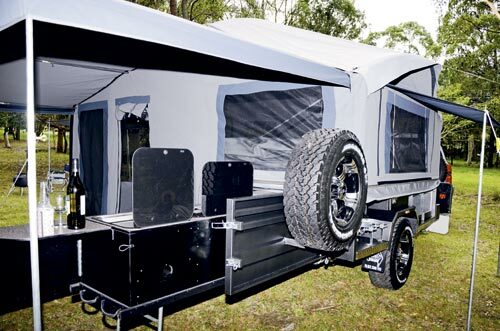 If the faithful camper trailer is no longer up to scratch, the family is growing, or it's just time for an upgrade to something with better offroad capabilities, the Trackabout Safari SV Extenda might be right up your alley. 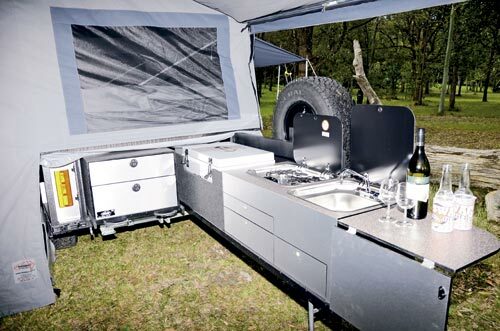 From a distance, these camper trailers sport a hard-core offroad look, but they are very modern and stylish at the same time, with a combination of charcoal-coloured powder-coated paintwork on the body, a shiny galvanised chassis, some stainless fixtures, a neat tourneau cover on top, and funky-looking 16in mags and tyres. 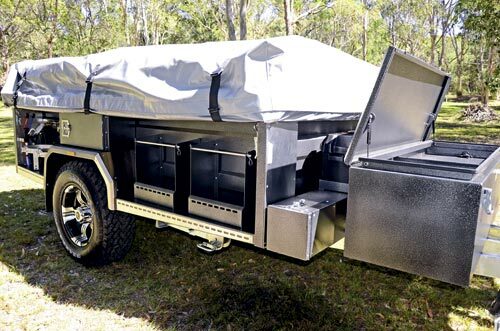 Although it looks compact, there are plenty of fittings not visible to the naked eye, and once opened up the trailer transforms into a very sizeable and comfortable rig. 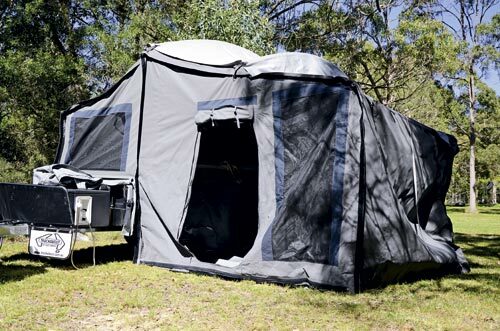 A generous 3000x2700m (10 ft x 9ft) canvas tent, colossal annexe, ergonomic kitchen design and plenty of storage space for jerry cans, gas cylinders and other gear make it an agreeable camping companion. 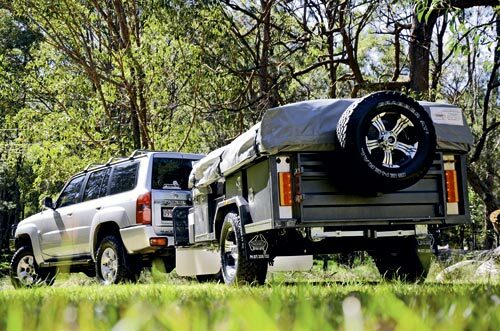 The Safari SV Extenda is not only great for those seeking a bit of staying power, but it's also suitable for a quickie (an overnighter, that is) on and off the road. As tested, the Trackabout Safari SV Extenda sets the wallet back a gentle $30,995, which in my opinion is not too shabby when you consider all the features packed into this unit. 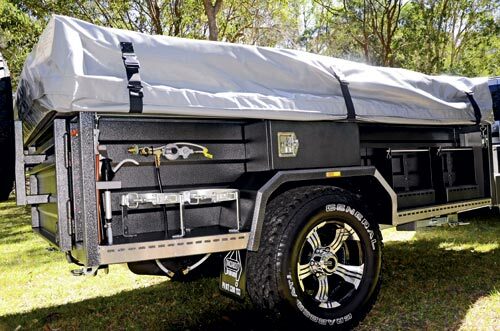 With a Tare of 990kg and a construction comprising a 50x50mm RHS hot-dipped galvanised steel chassis, 100x50mm triple RHS galvanised drawbar, double-pressed zincanneal (powder-coated) body construction, Al-Ko eight-leaf outback suspension, drop-down stabilisers, 265/70-16R all-terrain tyres with eye-catching Allied Wasp wheels and 10in electric brakes, there's no need to worry about things breaking on outback roads. 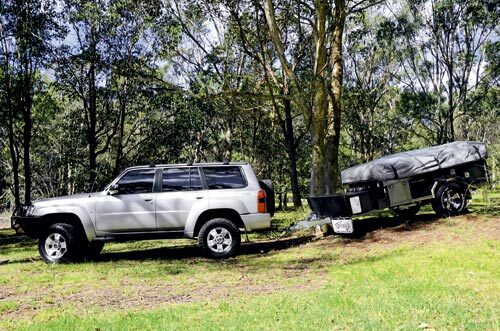 It has a sturdy drawbar with an Ozhitch coupling up front, and it spans a trailer-towing length of 5400mm (17ft 8in). 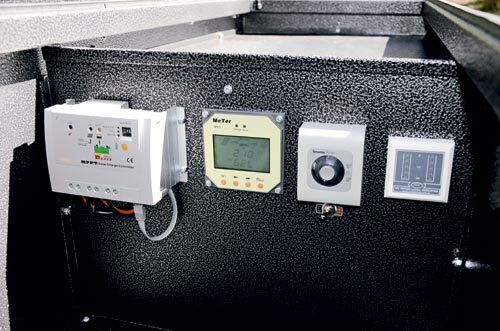 A large stone shield with mudflaps protects the trailer and the large storage box containing the electrical solar, heating and water monitoring panels. 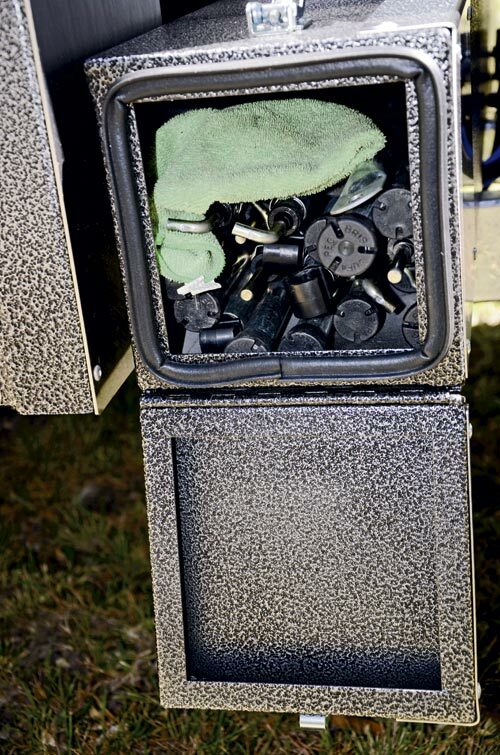 Housing for twin 105Ah batteries is mounted behind the electrics box on top of the sealed-pole compartment. Moving back, there's provision for two or four jerry cans, a centred stowage compartment and dual gas-cylinder compartment. Something I did appreciate in the build were the heavy-duty water and dust-proof seals throughout - always a bonus when it comes to travelling on dusty outback roads. 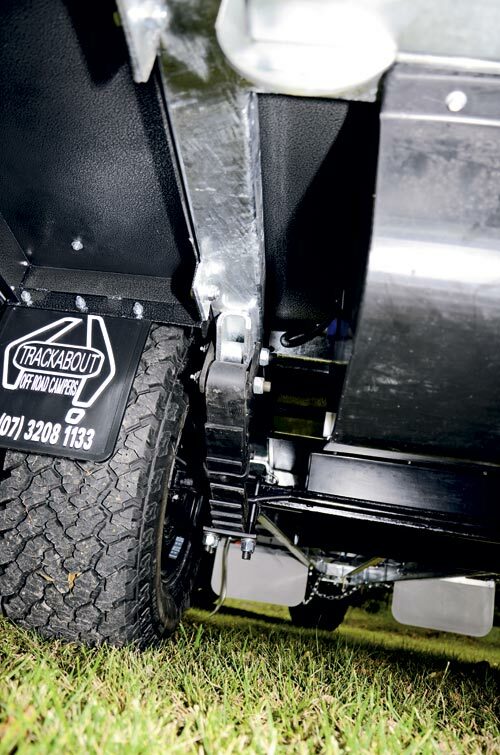 At the rear, the swing-arm tailgate is on a heavy-duty greasable hinge system to support the weight of the spare tyre. Once open, the kitchen pulls out and consists of a prep area, sink with hot and cold water, recessed dual gas burner, 60L Evakool fridge/freezer, and plenty of cutlery/storage drawers, all finished off in laminate and plywood in a stainless steel look. It's a decent-sized kitchen set at a workable height, and it's protected by the annexe and kitchen wall (with window). A full enclosure is optional, and probably something I would opt to have for when the weather turns bad. 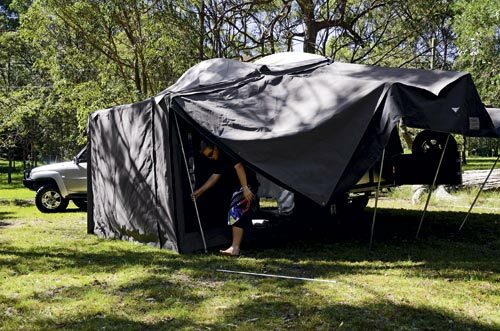 When it comes to the tent side of things, the setting up and packing down process is one of the things I observe closely, because I'm one of those campers who doesn't like to take long to set-up camp. Anything longer than 45-minutes does my head in (and interferes with valuable fishing time). The Safari SF went well, with the assembly process done single-handedly - at a mellow pace while sipping on a nice cold beer. All told, the process took 20 minutes. Once set-up, it's actually amazing how spacious the tent area is - far larger than I've seen before. 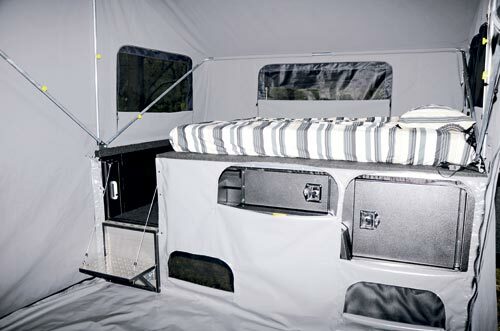 To start with, it has generously laid-out sleeping quarters for two adults. And instead of having to clamber up a ladder to get to the queen-size bed, a side door folds down to create a step to a 600mm walkway. 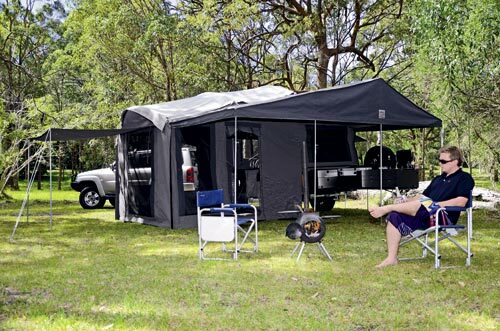 The walkway incorporates two box drawers, and there are another two on the side facing into the tent, providing plenty of storage without compromising living space. The living area is a healthy 3000x2700mm (10ft x 9ft) and spacious enough to accommodate a whole shoal of kids, or if you would prefer to leave the snappers at home you could set it up nicely as an indoor lounge and dining area. 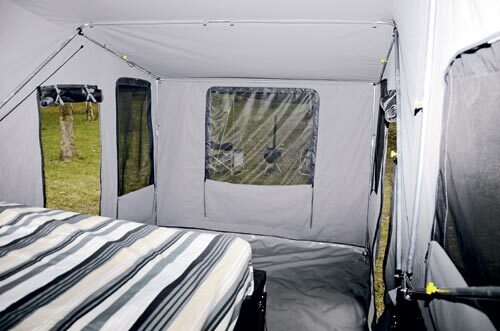 Natural light and ventilation is also no problem in the tent section due to the dual doors and an abundance of windows. On the outside, the sides feature dual shade awnings in addition to the large annexe over the kitchen. A tropical roof complements the main tent, doing its part to minimise moisture and keep the temperature down. 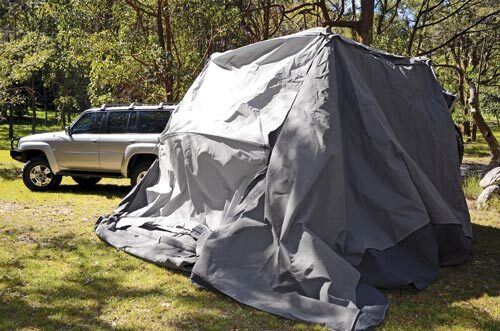 Constructed from 12-15oz Dynaproofed Wax Converter canvas and featuring quality screens and easy-sliding zips, the tent should last for many years. 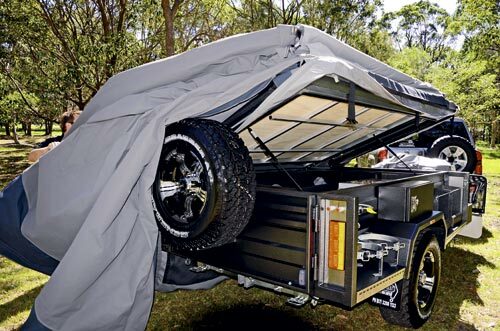 Instead of importing them, Brisbane-based Trackabout manufactures its own tents, which is great to see. It's a pretty simple process to dismantle the tent - a solo job that takes approximately 15 minutes at a leisurely pace. I'm no brain surgeon, and I reckon it wouldn't require too many attempts to get the process down pat. 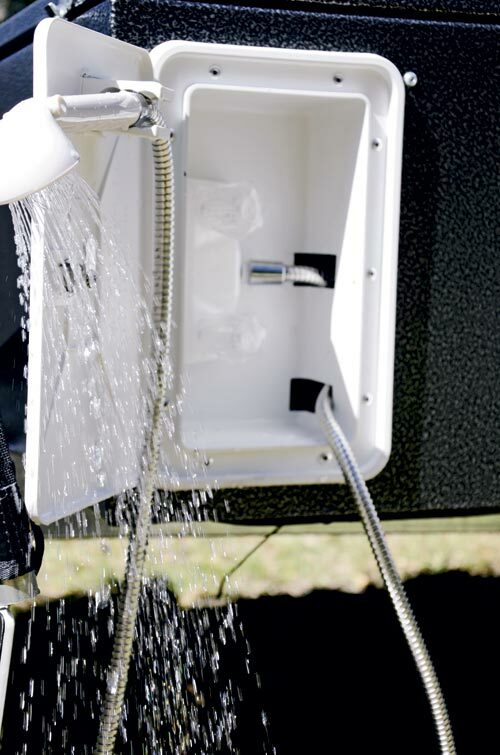 There is always so much more to camper trailers than meets the eye, especially when you consider what's included in any given package. The Trackabout Safari SV Extenda has much to offer - too much to detail here - so it's definitely one rig you need to take a closer look at for yourself. 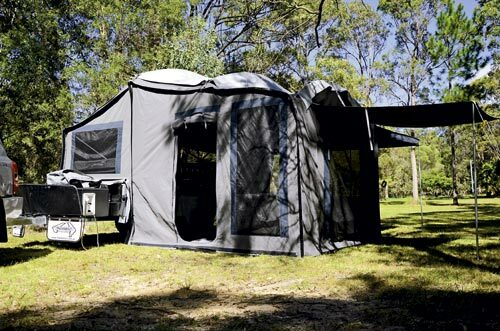 From top to bottom, the quality of construction is evident and it's loaded with enough standard creature comforts to keep the family happy, both when within the clutches of civilisation or when out in the back of beyond. Trackabout has hit the mark with the Safari SV Extenda, but it's also nice to know you can customise it with any of a variety of factory options, should you wish to bling it up. To top it all off, this package also represents great value for money. What more could you ask for? The Trackabout Safari SV Extenda tracked beautifully behind our Nissan Patrol. 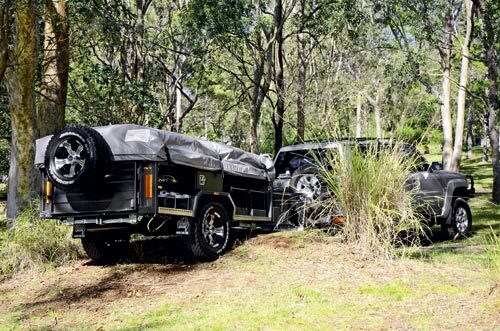 With a Tare/ATM of 990/1400kg, the Extenda was well within the Patrol's prescribed towing limits, while the chassis construction and oversized tyres provided decent ground clearance to suit rough bush roads. 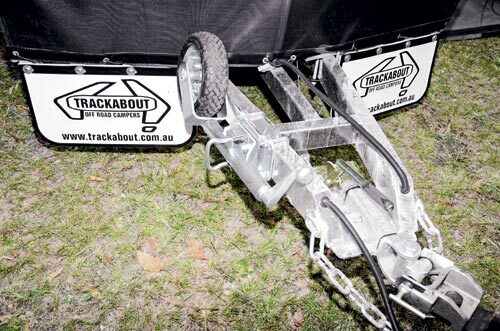 The trailer tracked well without any wobbles at speed, indicating there was the right amount of weight on the coupling, and with a width of 1220mm it sat nicely behind the 4WD. It was quiet offroad and with the oversized 4WD tyres, it held well on loose gravel. 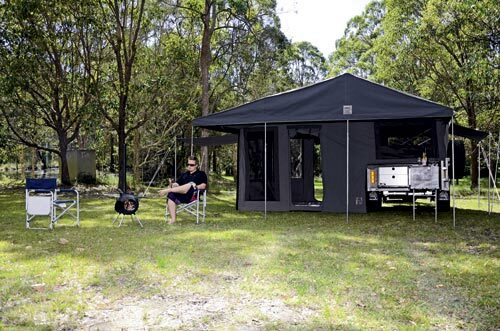 Find Trackabout campers for sale. 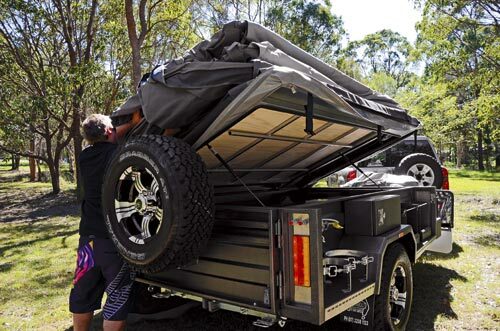 Search for new Trackabout campers.